Go For It is a short, sweet read packed with enriching scripture quotations and quotes from some of our most respected figures. It's a celebration of your dreams. Dreams take time, patience, sustained effort, and a willingness to fail if they are ever to be anything more than dreams. Need some motivation? 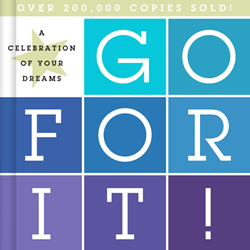 Go For It is a self-help book design to encourage its readers to fulfill goals, follow dreams, and overcome obstacles. Just ask the 200,000 other readers finding strength and clarity throughout the book's quotations and quotes. Go For It is built around five essential elements; Begin, Dream, Discover, Do, and Persevere. They are designed focus on specific areas of the reader's life in order to fulfill dreams, accomplish goals, and build an everlasting legacy. Below is a sneak peak at just a few of the quotes that have readers shooting for the stars. "Dreams take time, patience, sustained effort, and a willingness to fail if they are ever to be anything more than dreams." "To dream the impossible dream is to begin to make it possible." "Remember, the world always looks brighter from behind a smile." Under its imprint Woohoo Ink, Russell Media has redesigned and re-equipped Go For It to encourage and provoke its readers to look beyond their struggles and challenges and focus on a new horizon filled with thrilling possibilities. Additional quotes, a page dedicated for a place to sign who it's from and to, and the color scheme has all been added or changed. Russell Media is an transmedia publishing firm focused on creating resources that lead to the positive transformation of society by providing strategic publishing and cause-related marketing services to increase social impact for many organizations. The Woohoo Ink imprint gives readers access to a variety of self-help books encouraging personal growth, happiness, laughter, and an assortment of life skills and knowledge. Russell Media's Newsletter allows for readers to learn about its books , services, and more discounts. Purposeful Resources Transforming SocietyRussell Media is an transmedia publishing firm focused on creating resources that lead to the positive transformation of society. We also provide strategic publishing and cause-related marketing services to increase social impact for many organizations.